This chapter articulates the challenge that educators, school leaders, and teacher educators face today in preparing learners for their future, given the reality of students’ and teachers’ lives today. 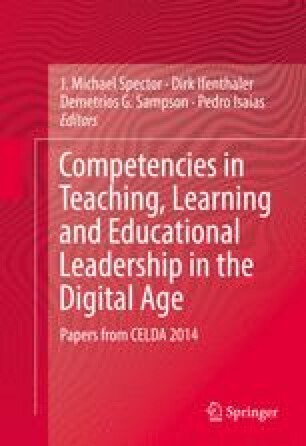 It then provides a US perspective on teacher and leader preparation, specifically related to the use of ICT and goals of preparing individuals for twenty-first century expectations. It explores the pressures, issues, regulations, challenges, and goals of preparing educators and leaders for the schools our students need. Through a review of the extant literature and current trends, readers will gain knowledge of best practices and recommendations for future steps. Becker, H. J. (1985a). How schools use microcomputers: Summary of the 1983 National Survey. The Johns Hopkins University Center for Social Organization of Schools. Retrieved from http://files.eric.ed.gov/fulltext/ED257448.pdf. Becker, H. J. (2000). Findings from the teaching, learning, and computing survey: Is Larry Cuban right? Retrieved from http://www.crito.uci.edu/tlc/findings/ccsso.pdf. Fullan, M., & Langworthy, M. (2014). A rich seam: How new pedagogies find deep learning. London: Pearson. Retrieved from http://www.newpedagogies.info/wp-content/uploads/2014/01/A_Rich_Seam.pdf. Nagel, D. (2014). Spending on instructional tech to reach $19 billion within 5 years. The Journal. Retrieved from http://thejournal.com/articles/2014/06/11/spending-on-instructional-tech-to-reach-19-billion-within-5-years.aspx.